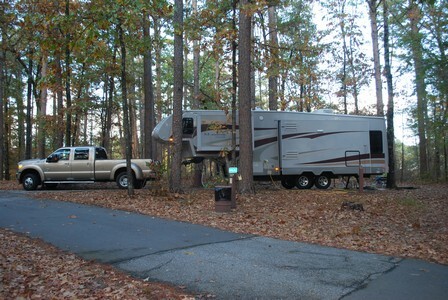 We have decided to stay here for another week, the park and area is nice and we haven't done much exploring as of yet. The weather is also quite good. 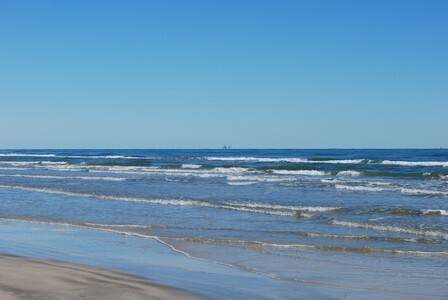 This morning we drove down the beach to Port Aransas and did a little shopping (of course we didn't take the camera!). 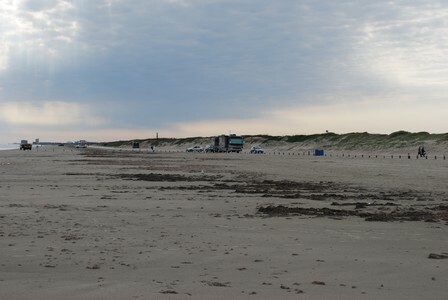 No problem, tomorrow we have to be away from the trailer for a while as we have arranged to have it washed and waxed, so we will explore the beach and area some more, this time we won't forget to take some pictures! 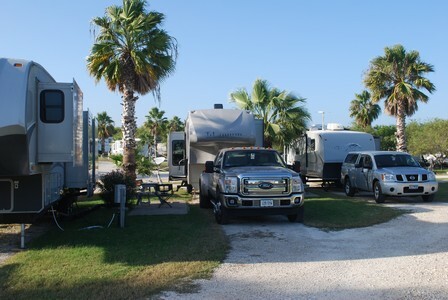 We also plan to take a run down the coast during the week to scout out our next campground on South Padre Island if we can find a nice spot on the beach. 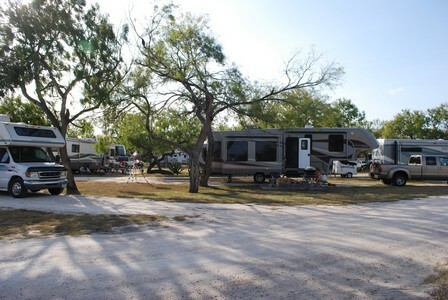 We are well settled in here, we've met some nice Texans and we are relaxing. 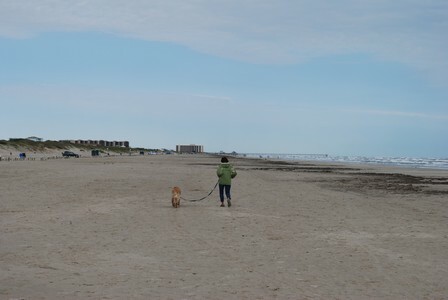 We hit the beach yesterday to allow Kasey some play time (in fact he's back there today as I write!). he had a friend with him providing some competition for the ball. 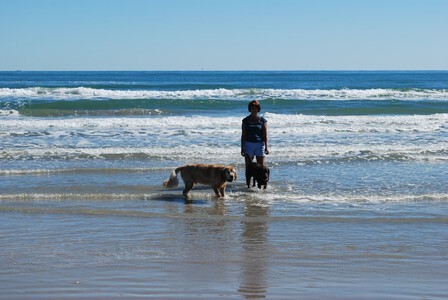 Both dogs started out with a ball each, at the end Kasey's friend's ball sank to the bottom of the beach somewhere and Kasey' ball was in two pieces shared equally by each dog! 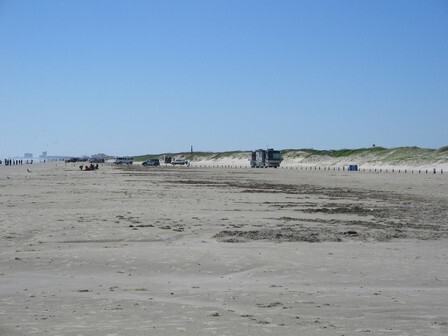 Today we moved all of 20 minutes down the beach on Mustang Island in the direction of Corpus Christi to Pioneer Beach Resort. it's a more upscale place (including prices!) 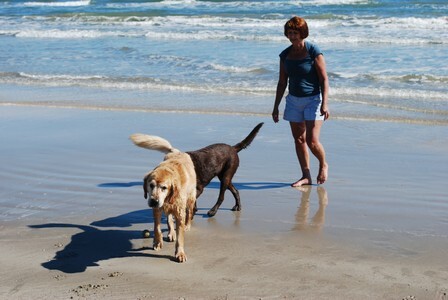 but the campsites are better than the previous place and Suzette tells Al that the beach is quieter! 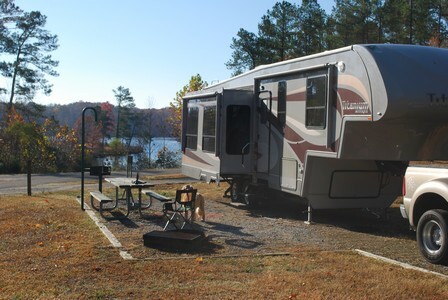 It's rated a 10 on the campsite reviews, Al was impressed with the service. One of the propane tanks was empty (only our second tank to be used so far on the trip) and as the tank was being removed from the camper an attendant on a golf cart came by and offered to take it to the refill station and return it! The charge goes on our account to be settled when we leave. Talk about service!! 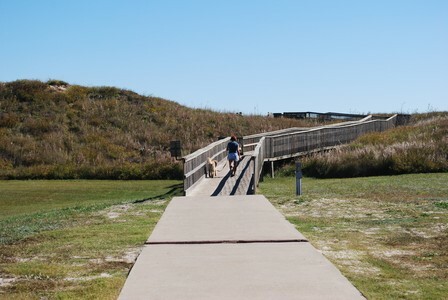 The campground is also a little further away from the gulf which reduces the salt spray on the camper but it's close enough that there is a walkway over the dunes to the beach. More pictures will follow tomorrow. 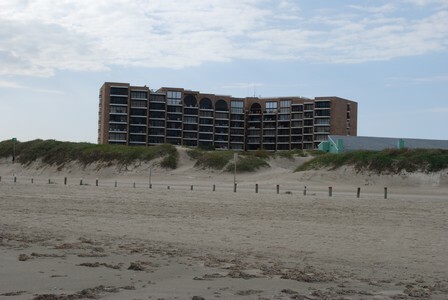 We are staying here for a week as the place looks good, the rate should also be better that way but we have to pay additional for the electricity we use, we will see how it compares to the daily rates. 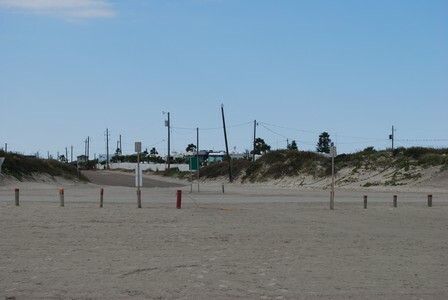 Yesterday we made the 45 minute or so trip from Seabreeze to On the Beach RV park in Port Aransas, taking a small ferry ride onto Mustang island. 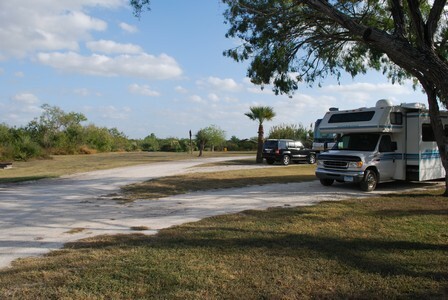 We are tucked into a campsite that is close to the road to the beach, it's about couple of hundred feet to the beach. It's nice to be so close but it comes at a bit of a price, it continued to be quite cool and breezy yesterday, our "Ontario jackets", long pants and socks were back on. There is an unusual cold front going through the area, this morning it's below freezing in Corpus Christi! The picture looks a lot better this morning with the sun out! We enjoyed some nice shrimp take out last evening, there are lots of places to get seafood, both cooked and fresh to take home and prepare. We plan to enjoy some good seafood meals while we are here! We relaxed today and prepared a thanksgiving dinner of turkey, mashed potatoes and salad to celebrate our second thanksgiving this fall (as Canadians we celebrate Thanksgiving on the second Monday in October). We passed on the potluck dinner here at the park, we didn't feel we knew enough people to go to the dinner. 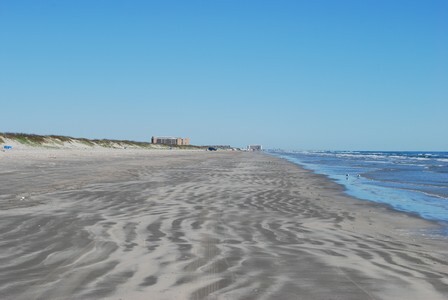 We move to a site closer to the gulf tomorrow, we look forward to a few days walking on the beach. 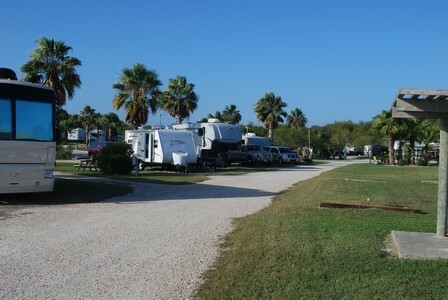 We got to this RV park yesterday afternoon after a short run from Mathis Texas. 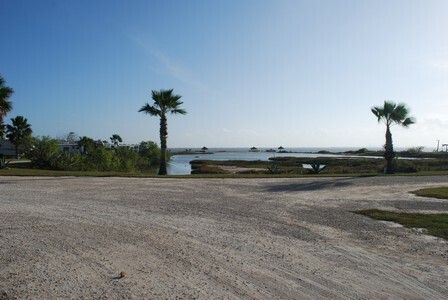 We are on a bay near Corpus Christi and close to the gulf. 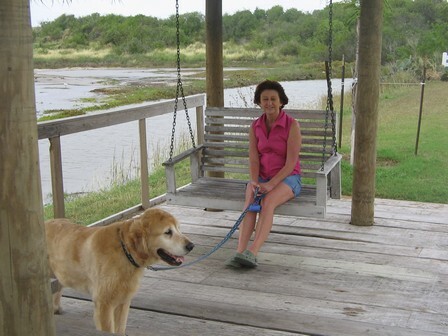 Diana, who is a member of the Titanium owner's group helped us to get a site here, thanks Diana!! We can tell we are close to the gulf, in the evening the humidity condenses on the window screens! 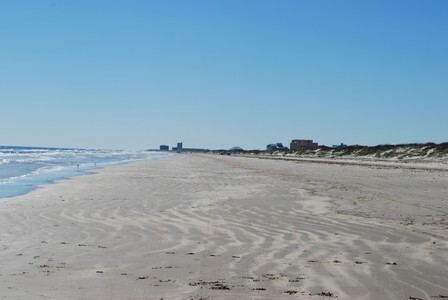 We booked 2 days here but we will book two more so we can check out the area and see the local sights, Al is also looking for some seafood! 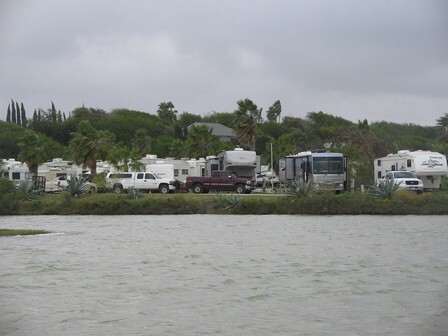 Today we checked out the area to scout out some RV parks closer to the gulf and we found a couple, we hope to move on Friday to a place called On the beach RV park near port Aransas. 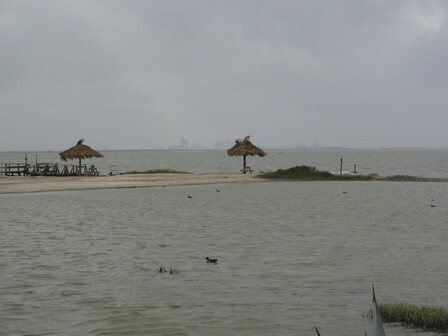 Seabreeze is a good park but the other one reminds us more of Mexico! 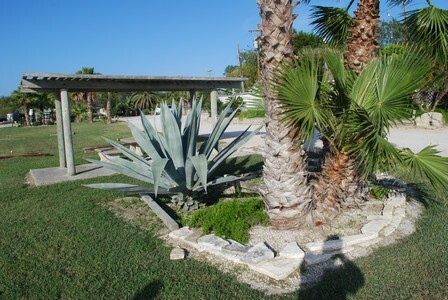 They keep the place well landscaped and maintained! Th sites are a bit tight but the neighbours are friendly! 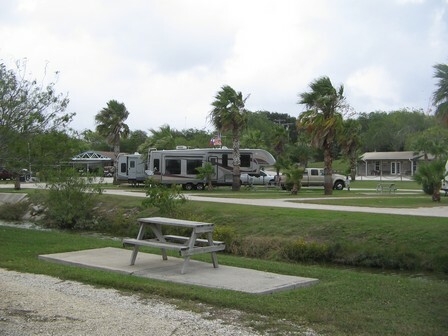 We have been in the KOA here near Corpus Christie for a couple of nights, it's a nice stop near lake Corpus Christie. We've gone from needing heat overnight in previous stops to needing air conditioning (almost!) 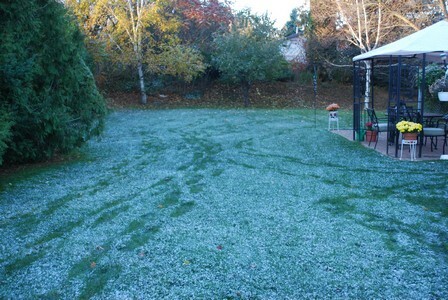 during the days here, it's been 28C or so during the days, a nice change. 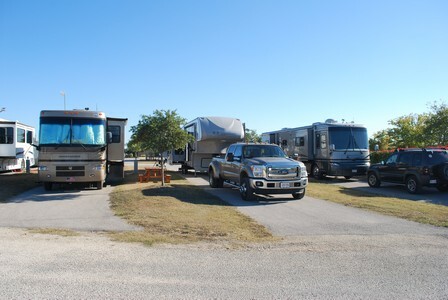 We plan to head for the gulf coast tomorrow (to Portland Texas), we hope to get a spot at the Seabreeze RV park there for a couple of days, we want to check out the gulf coast area and find a good spot to stay for a week or so. 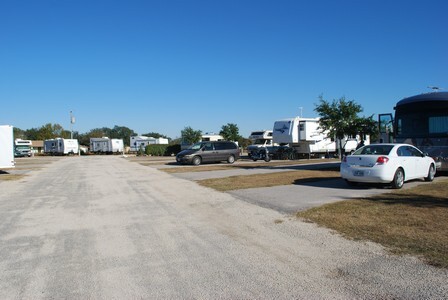 We stopped here today in what appears to be a bedroom community just north of Austin. We are in a KOA again, a lot better than the one we stayed at last night. After we arrived we did some shopping (to replenish an almost empty fridge!) at a mega store called HEB. We haven't shopped at this store before, it had good selection and variety. 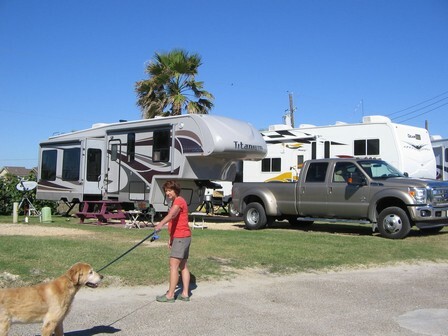 We will head to Corpus Christie tomorrow and another KOA, then we will hit the gulf coast and look for a spot to relax for a few days, perhaps over the US Thanksgiving. 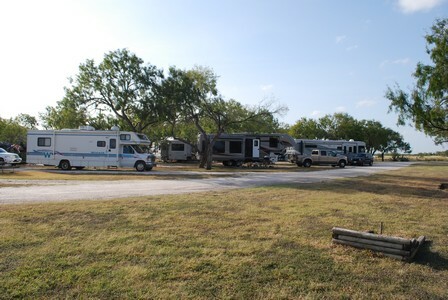 Today we are in a KOA just north of Waco Texas. 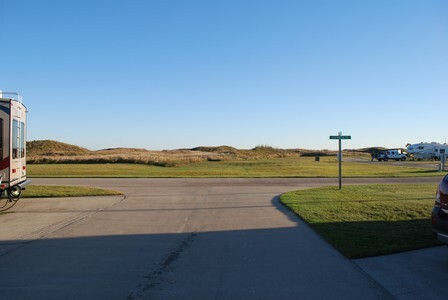 Last night we stayed at Lake Bob Sandlin state park near Mount Pleasant, we got on the road this morning intending to hit a state park west of Dallas/Fort Worth but we realized that if we wanted to head to the Texas gulf coast we should head south from DFW in order not to backtrack. We obviously hadn't planned today's segment so we just stopped at a KOA here after doing our 300+ km. or so. 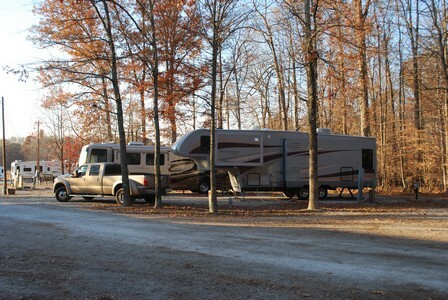 The KOA here isn't memorable but it's a short stay. 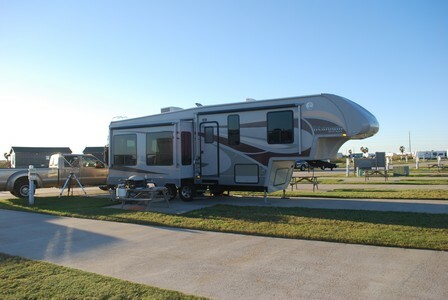 It's coming up to a weekend and next week is the US thanksgiving week, we will stay at another KOA near Austin tomorrow night and by then we should have some kind of a plan together on stopping on the Texas gulf coast over thanksgiving. We arrived here after 1:00 pm today, we got soaked breaking down camp in Village Creek, it rained all night last night and into the morning hours. The weather started to clear mid day and we enjoyed some time this afternoon outside in the sun. Tomorrow it's off to eastern Texas! Today we did some shopping in Wynne and had our first BBQ on the road, it was cool here in the morning but the sun came out in the afternoon to warm things up. We also had a campfire which helped. 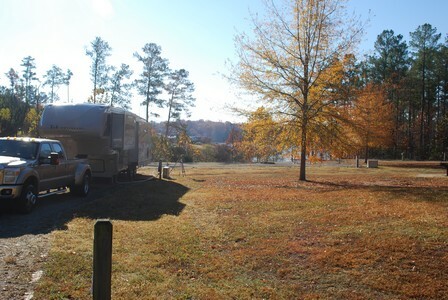 Suzette took Kasey for a walk in the morning and saw a half dozen deer in the campground (no camera of course! 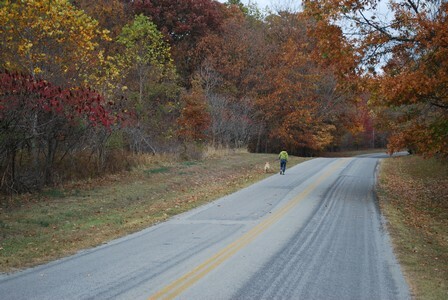 ), our walk together in the afternoon with the camera was fruitless. 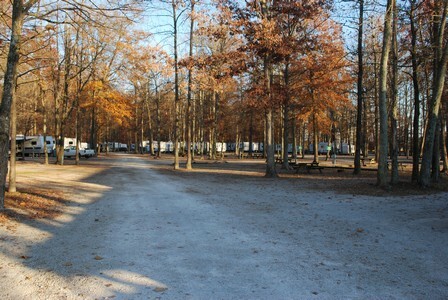 We are virtually alone in the campground! 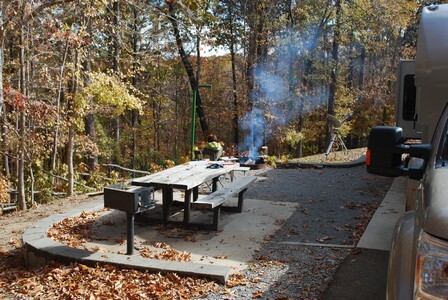 Kind of hard to see but these campground workers are blowing the leaves off the concrete slabs in each campsite. 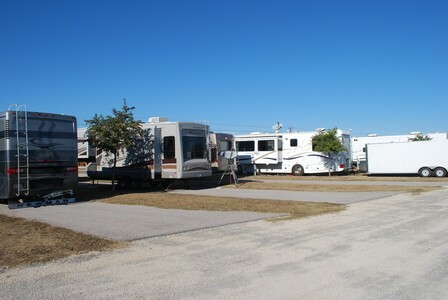 All for $28.00 for a full service (50 amp hydro, water and sewage) campsite! Take that Ontario Parks! 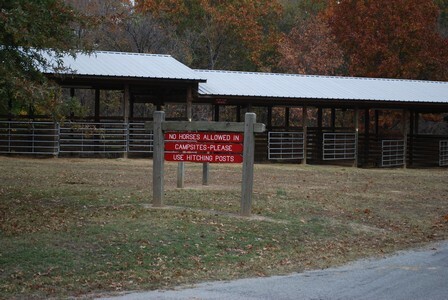 A view of the horse campground, the sign indicates that you can't take your horse to your campsite (close by) but you can hitch it or put it in the individual stables provided. 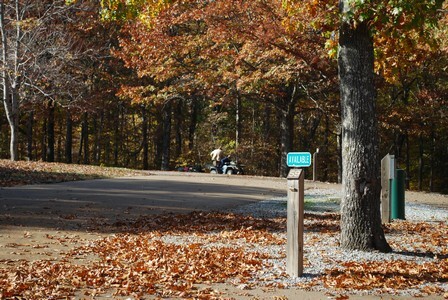 Tomorrow we are off to western Arkansas, we probably will be in the trees so no posts! 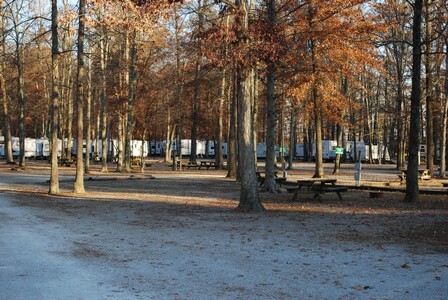 We arrived here around 2:00 pm today after a longish run from Natchez Trace. 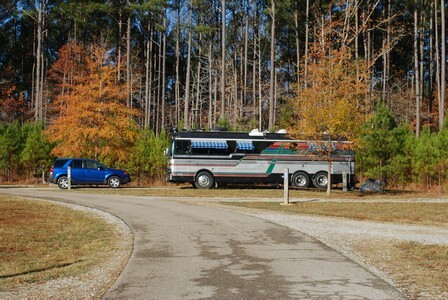 We met a gentleman (named Al) from Ajax Ontario at Natchez Trace, he was driving a Bluebird Wanderlodge motor home of 1980's vintage, a beautiful RV. 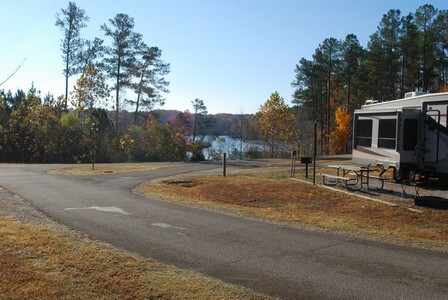 We are here at Village Creek for a couple of days, a break before we head west! 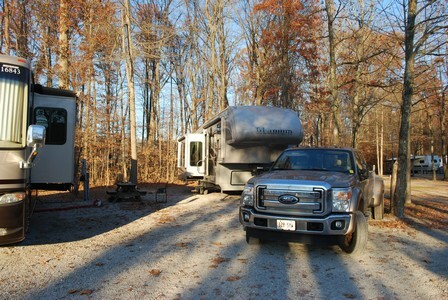 We haven't been posting much as we were in the trees at the Bowling Green KOA last night, the wifi there was "iffy" so we just downloaded E-mails. 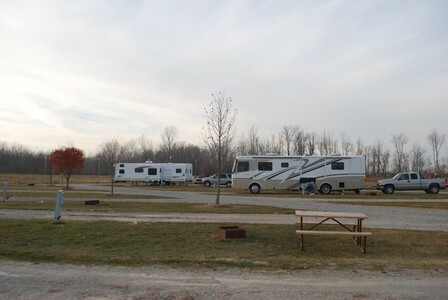 The weather in Bowling Green was great, in the high 20's C, Suzette was in her shorts and Kasey enjoyed the dog park at the KOA. Today it's cooler here and there is some rain, the locals are glad to see it as there has been a drought here over the summer, the grass is all burned up. 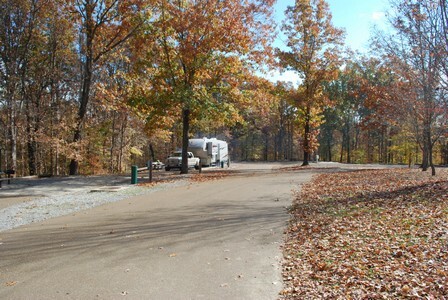 We plan to stay here in Natchez Trace tonight then spend a couple of days at Village Creek State park near Wynne Arkansas. 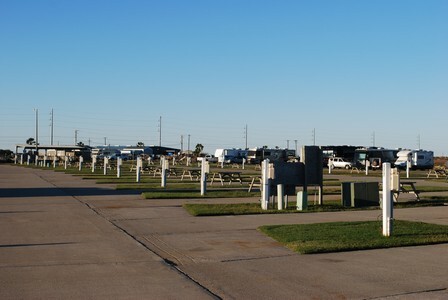 We left yesterday and stayed at Harbortown RV Resort in Monroe Michigan as usual on our trip south. 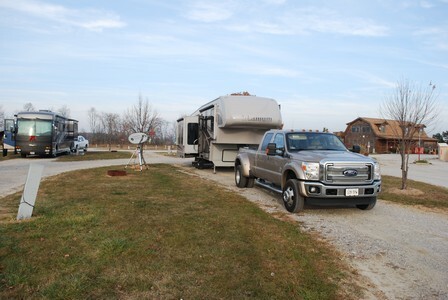 We were subjected to a secondary inspection at the border crossing in Port Huron Michigan, we were questioned at the initial stop then directed to park the RV for a secondary check. I think the reason was that we had a tomato or two (that we declared), apparently these are a no-no coming across the border. What is allowed seems to change each month so we decided to bring items from our home refrigerator with us with the logic being that if it was confiscated at the border it wouldn't be a lot different than throwing it in the trash at home. Besides, it's cheaper, at home it costs us $2.00 per garbage bag, at least at the border it's free! We didn't post from Monroe as we had a problem (fun with wires!!) with the satellite internet system and the park wifi at Harbortown wasn't working great. Today's short run to the Auburn Indiana area gave Al some time to diagnose the internet problem. It turned out to be a coaxial connector problem on the transmit line. 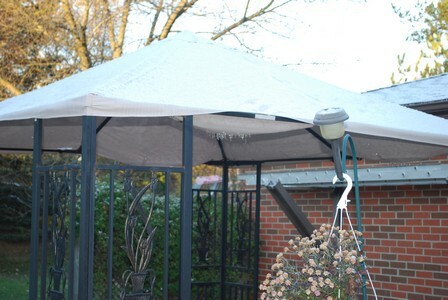 Luckily there was a Home Depot store in Auburn where some connectors were purchased (plan "A") along with a couple of 50 ft. lengths of RG-6 coax cable with connectors on each end (plan "B"). New connectors were crimped on the existing transmit line and that solved the problem, so we have some extra coax cable for future uses just in case. In addition, the satellite TV system was connected so we now have both services working well. 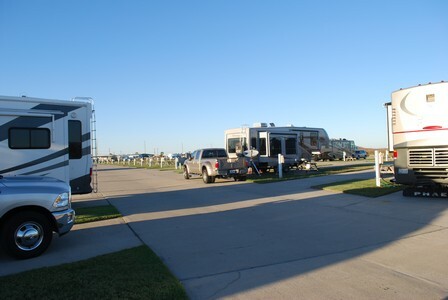 First days on the road after the RV has been in the driveway tend to be those requiring some maintenance. The RV water system was winterized with RV anti-freeze so it had to be flushed out, and there appears to be a small water leak around the water filter under the kitchen sink. We will see how the leak progresses over time. We enjoyed a great supper here in Garrett this evening at a restaurant that we normally stop at. In addition the temps have been in the high teens C with sun each day, so the trip has been great, the warmest we've seen on our way south!. The new pickup is working great, the fuel consumption is a bit more than the old pick up, we will see how it does long term. It's certainly more comfortable (and more powerful!). 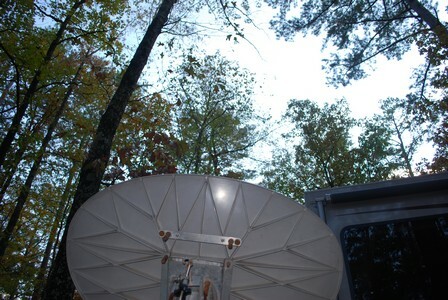 Our site with the dish finally working! She and her mother Chantal are doing well. She will be heading back up north this week (all to soon!). We will probably head south early to mid next week. We've been working on getting ready for the trip south for a while now. We were originally planning to head back to Mexico (in fact we confirmed our intentions to Rafael at Villas Onac), but the Canadian government travel warning changed all that. After the warning was issued, our out-of-province health insurance policies "fine print" was looked at, the only thing that was indicated was coverage not being available in war zones. Just for completeness, our carriers were called to confirm. Manulife's response was if we were injured by something involving the travel warning (say a hijacking or shooting) we wouldn't be covered, but everything else would be covered. The other carrier (TIC) responded that they would not cover us in Mexico!! In discussion with another person we know who goes to Mexico ( http://www.contessajewall.com/) who also uses TIC, she indicated that she went up the ladder at TIC and confirmed that TIC has the same limitations as Manulife. So, we thought about it a bit. We came to the decision that we wouldn't be going back to Mexico this winter. We didn't want to worry about coverage/no coverage on the insurance side and the repercussions of what hoops we would have to go through to cover the costs of medical treatment and repatriation should we be innocent bystanders in a shootout/hijacking. Some folks have indicated that the Mexican tourism folks would pay, others have indicated that our provincial health care would likely cover costs of treatment in Mexico. Bottom line is that "where there is smoke there is fire", Mexico is more risky this year compared to last year, if we have to worry about the trip, it's not worth it. We will miss the warmth and beauty and friendliness of the folks in Mexico. Hopefully things will quieten down over the winter and we will be able to return to Mexico next winter. We will explore the SW United States this winter, we have done some exploring in previous years while transiting to Mexico, this time we will explore in more detail. 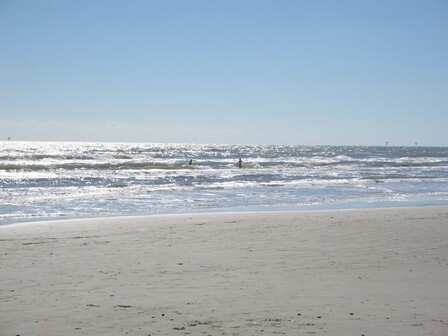 We hope that the gulf coast of Texas will be almost as warm as Mexico. 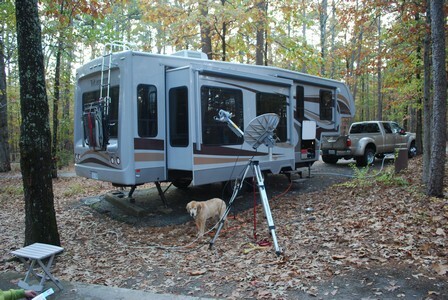 One of the preparations for the trip south this year was to invest in a new tow vehicle. 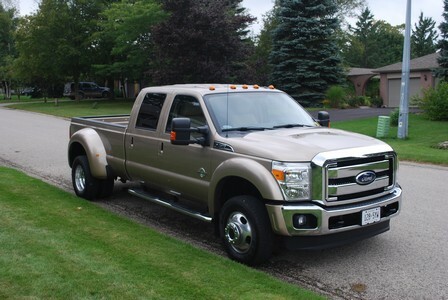 The older Ford was getting on in age and it was a bit light for the weight of the trailer. The new one will handle the trailer weight with ease, but it won't be quite as easy on fuel. It has just over 2,000 Km. on it and I've been able to wring about 18.5 miles/imperial gallon out of it (unloaded) compared to 21 for the old truck. Hopefully the mileage will get better after the engine break in period. 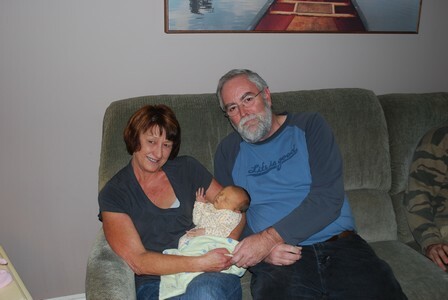 We await the birth of our oldest daughter's second child (and our third grandchild!!). The due date was yesterday so we expect to hear some news soon. We will hang around for a week or so after the birth, best guess is that we will be hitting the road before mid November, or perhaps earlier.